If you are planning on traveling to Rome – perhaps on a year abroad, a business trip, a holiday or otherwise – My Baggage provides a fast and affordable student shipping service to help you transport your luggage there safe and sound. Being the largest city in Italy with an enormous wealth of culture and international influence, it’s easy to see why so many students make the choice to study in Rome. It’s the perfect city for students who want to be immersed in a diverse Italian city rich with history, art and architecure – all while having easy access to travelling in and around Italy and Europe. Providing a high quality of education is a particular area in which Italy has earned a sense of pride, offering some of the oldest universities in the world. International students will be given incredible options for education when considering spending a year studying in the city. While Rome is a very accessible city – being only a short plane journey away – transporting luggage there can be a different kind of story. It’s a well known fact that airline baggage fees can work out extremely expensive, not to mention highly restrictive with limited baggage allowances. Thankfully, My Baggage offers the perfect solution to these problems. We can ship your luggage at a price you can afford with a generous weight allowance of up to 30kg per item – meaning you have the freedom to bring all of your essentials. To make the process as easy and as stress-free as possible, My Baggage provides a convenient door-to-door service. All you have to do is book and pay for your shipment online and we’ll take care of the rest. You’ll be provided with full online tracking as well as SMS and email notifications to keep you up to date with the whereabouts of your shipment whilst it’s in transit. And if you happen to have any questions or concerns, we have a dedicated customer service team who will be happy to help you with anything you need via phone, email and live chat. 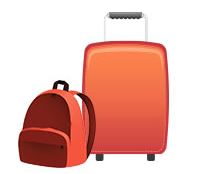 At My Baggage, we make sure that the service we provide is fast and efficient. We understand that when moving to a brand new city, the last thing you want is to have to wait around for your luggage – especially if you’ve packed away all of your essentials in your suitcase. That’s why we offer super fast luggage delivery times to save you from that worry, with delivery times of 3-5 days to Rome. We also offer an express delivery time of 1-2 days, so it won’t be long until your luggage arrives with you safe and sound. As many of the My Baggage team have traveled and studied abroad, we understand better than anyone that students moving overseas have enough financial commitments, and transporting luggage internationally isn’t exactly a cheap process. That’s why our costs are super low to ensure we can fit a student budget. We also provide a handy Price Match tool; so even if you find a cheaper price elsewhere, we’ll try to beat it! You can get a quote anytime.